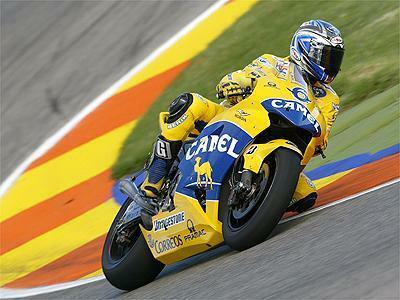 Camel Honda has announced its official 2005 MotoGP rider line-up: Alex Barros and Troy Bayliss. Both riders will be riding the yellow Camel Honda RC211Vs on Michelin tyres. Bayliss, WSB champ in 2001, joins Honda after two years in MotoGP with Ducati. The Australian scored 4 MotoGP podium finishes in that time. Bayliss will be assisted by Santiago Mulero, Head Technician and Ramón Aurín, Telemetry Engineer. Barros returns to the team led by Sito Pons. He rode for four seasons with the Honda Pons team from 1999 to 2002, and won 5 GPs and scored 14 podium finishes in that time. He will continue to work alongside Ramón Forcada, his Head Technician for the 2004 season, and with whom he worked throughout his previous time with the Honda Pons team, and Lluis Lleonart, his Telemetry Engineer. Camel ran Max Biaggi and Makoto Tamada in 2004.